The air data test set CPA8001 (ADTS) is a pressure controller specially designed for the calibration of measuring instruments of the aerospace technology. 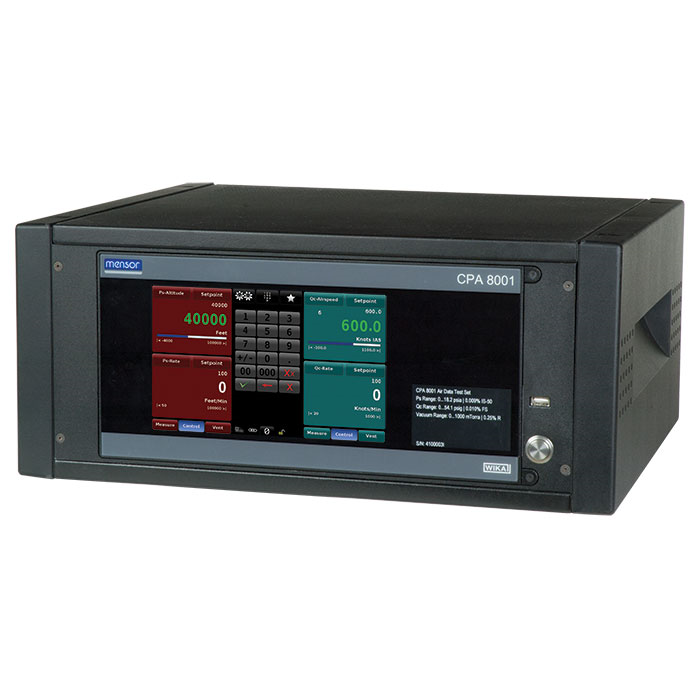 The CPA8001 controller can be used for calibration of both analogue altimeters, rate of climb indicators and speedometers and digital sensors or air data computers. Due to the modularstructure of the air data test set model CPA8001, it ensures the greatest possible flexibility for assembly according to customer requirements. The air data test set CPA8001 is available either as a desktop instrument or as a 19" rack-mounted unit. The instrument is equipped with two control units with the reference pressure sensor CPR8001. The sensor can be changed via the front, without taking out the complete controller (e.g. out of a calibration rig). A large, high resolution touchscreen, coupled with an intuitive and user-friendly menu navigation ensures the maximum operating convenience of the air data test set. The menu navigation is available in many languages. On the large touchscreen, all necessary information such as current measured value and set points for altitude, altitude rate, airspeed and acceleration can be found on a single screen. Optionally, the measured values can be also displayed in other pressure units. Moreover, the user can easily create extensive test programs using the instrument menu. The controller can be remotely controlled via serial interfaces. For this, a wide range of command set emulations of other ADTS instruments are available. On request, complete mobile or stationary test systems can be manufactured. There is an IEEE-488.2, RS-232, USB and an Ethernet interface for communication with other instruments, and thus the instrument can be integrated into existing systems.